To access the Message Notification settings, hover the mouse over Settings, then Messages, then click Notifications. You can opt to have notifications sent to your default address, or to additional email addresses you specify, when you receive any WebManager messages. Check the box for Main Dealership Address or Additional Email Addresses, and enter any additional email addresses separated by commas, without extra spaces. You can enter any number of email addresses up to 200 characters. Notifications can also be sent to mobile phones as SMS Text Messages. Up to 5 mobile numbers may be setup. Enter the phone number and click the dropdown menu to select the Carrier. Click Send Test Message to confirm that the information was entered correctly. CRM software is designed to receive new leads from WebManager in Auto Lead Data Format (.ADF). 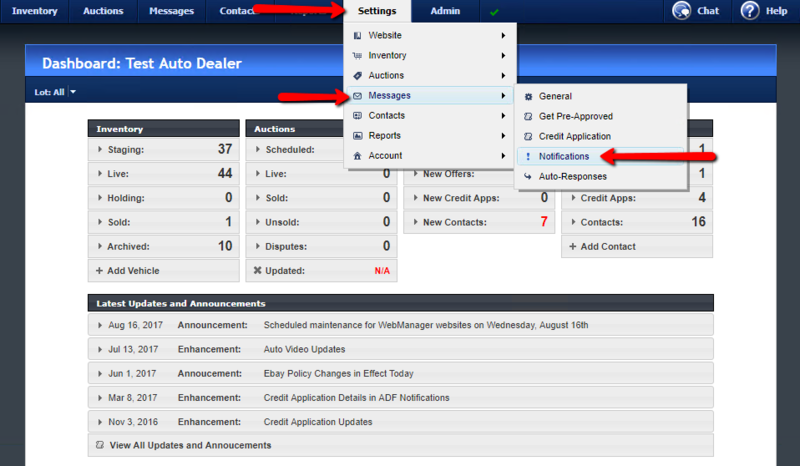 When a new lead is received in WebManager, the lead information will be sent to the provided email addresses. Check Same as Default Message Notifications to use the same settings as for Message notifications. If this box is not checked, you can enter separate settings for eBay Activity Notifications. Check the box for Default Email Address or Additional Email Addresses, and enter any additional email addresses separated by commas, without extra spaces.